As parents search for the ‘perfect’ preschool for their young child, they are often faced with a conundrum: should they choose a developmental play-based preschool or should they choose one of the popular “academic” preschool options? As kindergarten becomes increasingly academic, many preschools have transitioned from a traditional play-based environment to institutions that function more like college preparatory schools. Parents are enticed by the fact that their young children might be able to fill in a worksheet or spout rote facts such as the ABCs and 123s by the time they are three. But are academic pencil-and-paper preschools truly beneficial or do they stifle creativity, physical development and the ability to learn critical social skills? Conversely, do quality developmental preschools actually sacrifice academics by foregoing worksheets and encouraging play? This past year, our transitional kindergarten attempted to watch the historic Endeavour fly-over. Although they didn’t get to see it fly over our school, a spark of excitement was ignited. From this experience, our energetic 5-year-olds embarked on an in-depth study about outer space. While maintaining the play-based philosophy, this class gleaned academics that were akin to that of third and fourth graders! From the beginning, the children were actively involved in the development of this project. They made a three-tiered chart on what they already knew about space and what they wanted to learn; the chart concluded with a summary of what they had learned by the end. They created “thinking webs” to organize their ideas on how to integrate space into their daily curriculum and learning experiences. 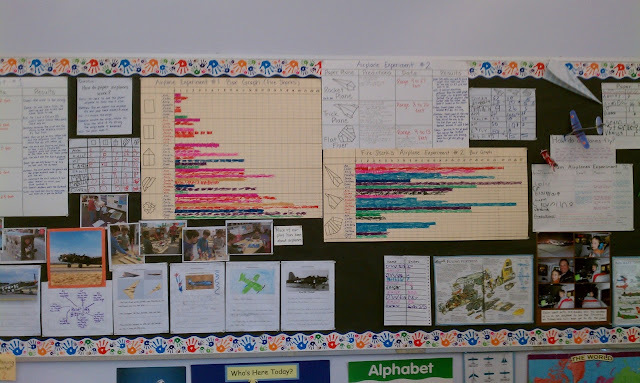 As a group, they made charts about what types of materials, books, games, fieldtrips, and experiences would increase their learning opportunities. With the help of their teacher, they designed their own dramatic play area, complete with a HUGE child-created spacecraft, space suits, and a mission control station. They created their “own” planets, wrote about space in their journals using ‘proper’ pencil grip and letter formation, authored a short report on their chosen planet, independently sculpted space ships from recyclables, and made realistic moonscapes out of clay. They designed paper airplanes and then measured and graphed the distances they flew. They played games about space that integrated phonics, math, reading and writing skills. A not-quite-to-scale model of all the planets was created by the students using paper-mache and then hung from their classroom ceiling (the planets were hung in the correct order from the sun, of course!). To culminate their studies, they invited Will Allen, one of the key scientists who worked on the Mars Curiosity Rover, to speak to their class. They also went to see the original influence of this project - the Endeavour itself - at the California Science Center. As they progressed through this journey, the teachers carefully documented and observed the learning and interactions that took place. They watched as the children grew in their knowledge and in their ability to work as a productive citizen in the class. To say this experience was limited to our transitional kindergarten would not just. Our three-year-olds had an equally engaging study on trains where they built their very own steam engine from a refrigerator box, complete with cattle-catchers and pistons! Our pre-kindergarten class explored the wonderful world of animals and discovered many new and exciting facts about our world. Research indicates that young children learn through direct experiences. They learn through touching, tasting, seeing, hearing, conversing, singing, writing, reading, playing, observing, testing, predicting, trial and error. Much like us, they learn through guidance, discovery, exploration, and adventure. At our school, we embrace that children can, and will, thrive academically and socially in a well-planned, balanced, developmentally appropriate, play-based environment. We have seen first-hand that when children learn through play, they are exposed to higher levels of socialization, language development, creativity, problem solving, and critical thinking. Finally, the DO develop the much-needed focus, determination, independence, physical and cognitive skills needed to not only thrive in kindergarten, but as scientists, CEO’s, professors, or wherever else God takes them! Funny enough, if you ask the children in our transitional kindergarten class what they did in preschool, their answer would inevitably be, “I played”.